The Great Respecter of Heights, Worth Grant, is way up in the top of that tree. Yes the man that wants to throw up when he sees anyone near an edge loves to climb trees and cut them down. He is a tree hugger, he hugs it before he cuts it down :). That was his joke not mine. Actually this tree had to come down, he does not cut trees down just for the heck of it. This was at Annie and Dan's house. I think that Will had a lot of fun watching Worth way up in that tree, actually three trees in one. BellaRose and I also got to spend the morning with Will while Annie was in a meeting. It is always so much fun to watch these two together. 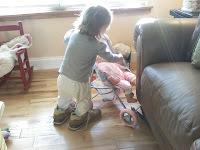 They can get really mad at each other and then the next second they are laughing hysterically pushing each other in the wagon and making pizza together. We are really going to test their limits today. Annie and I are heading to Raleigh with the babies to go see our good friends Ashlee, Byerly, Chesson, Melissa, and Elisabeth with all her babies. I am just so excited about this trip. These girls have meant so much to us for so many years. It is going to be such a blast to just hang out with them and not just be passing through. Thanks for hosting us ladies. We will be posting one million pictures, I am sure, upon our return! So I don't often use this blog to take a stand or give my opinion on what is happening in our world. I choose to keep this (for the most part) a friendly look into out lives as a family. I don't often talk about my faith or beliefs because I feel that if you truly know me then you truly know what I believe. But here is what I would like you to know, that I do believe people want change, and I hope that they do get the change that they are looking for. I do believe I need to support our current president whether I voted for him or not, whether I agree with him or not. I must support him because he now stands for me. I would like there to be no mistake, that I have ALWAYS been proud to be an American yesterday, the day before, today and always. This is the land I am bound to. It is the country that gave my Great Grandparents from Italy a chance, it is the country that gave the other half of my family from Ireland a chance. It is the country where I am allowed to tell you right here how I feel, and to believe in the God that I believe in without judgement or to be told that I am wrong. I am so proud of my friend who flies fighter helicopters in Iraq and I am so proud of my friend's son who died in Afghanistan fighting for and the country he believes in and adores. I am proud of my Dad and Grandfather who served in the military. I can't imagine how hard it is for any serviceman to think that just now people are saying they are proud. I realize that much of this won't sit well with you my family and friends, but I have listened to you quietly and without judgement and I just ask that you do the same for me. What a busy and exciting week we had. I love it when it is like this, and I think that BellaRose does too. We all like to be on the go. As you know it was Worth's birthday last week and we had his family over for some lasagna and rice krispy cake. Worth's sister made the rice krispy cake and it was so cute. She made it in a bundt pan. Worth is no lover of cake so we have to improvise when it comes to dessert. He has requested rice krispies for what seems like the last 5 birthdays. We do always grant his wish too. BellaRose had fun helping Big Daddy blow out the candles. Worth also got a snazzy new little camera for his birthday. That will be a lovely addition to the home technology, as it is nice to not always lug around our big ole camera everywhere. Thank you all for your birthday wishes to him, he is much aplidged. The next day we met up with Jennifer and Davis at the Health Adventure in Asheville. The babies got to run around and have an absolute blast. They were so intrigued by the floating plastic ball. Let it be noted that it was also Worth's favorite exhibit. It was a very nice reprieve from the cold as it was only 4 degrees in the morning that day. Oh goodness! Let it also be noted that snow is also FINALLY in our forecast. Of course they said it was going to start at 1 today and right now at 2:27 pm there is no snow. I know it is not a big deal to the Colorado Carrs, or the Michigan Mulders, and the Boston Combs' (that one does not flow as well), but to us 1 inch of snow stops the world. Just remember you came from the south (except Annie, but she was here long enough to know). I hope that it will be a little bit more snow then 1 inch, but so far it is not looking so good for the home team. Rest assured if there is snow you will be getting some snow pictures! We also had a lovely visit from my older sister, Kelly, and her family. Annie Singletary's in-laws have a house here in Black Mountain, and they let Kelly and the fam stay there for the night. They had so much fun staying so close to the lake and to town, thank you so much Big Dan and Lee Singletary! As always it is so nice to have family up here. We had plans, Saturday evening, as you will see below, but the Baird family had their own agenda and were just happy to be up here in our lovely mountains. Thank you for the visit and the fabulous breakfast at Early Girl Eatery Sunday morning! And now to the finale of our week (boy are you guys tired yet!)! We celebrated Matthew Hales Lowrance's 30th birthday. Worth and I got to go out on the town while BellaRose played with her cousins at his sister's house. Margaret organized it all, and we had a rowdy group of 16. What a trooper Margaret is being 30+ weeks pregnant and putting up with all of us. We had a blast and were just a tiny bit tired the next day. Midnight is not our usual bedtime. I know, I know, that does not sound real late, but let me tell IT IS! You people need to be getting to bed earlier if that is not late for you! Well that is about all the updating I have patience for right now. I really, really, really hope to be posting some snow pictures for you soon, but we shall see! My man has graced this earth for 34 years today! He has been my other for 9 years. BellaRose's dad for almost 20 months (what!!). I have already told you he is the love of my life, and that I am more complete with him, yada yada. I don't meant to down play that but you know all this. Let me think of things that you don't know about. What are some things that might totally shock you if you knew them about him? 10. He is a lot more gentle then he lets people believe, he has a heart of gold, and is loyal to his family. I love you dear man! It is funny what a kid will do if you just leave them alone for a little bit. BellaRose got a doll and stroller for Christmas and her maternal instincts are really coming out, except when she throws the doll on the floor and gets in the stroller herself. If I made a big deal about her doing something by getting the camera out then she would of course stop, so that is why the fuzzy pictures from my cell phone. 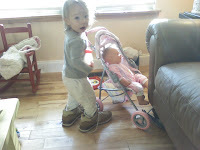 The pictures above are hysterical because she has put my shoes on and is giving the baby a bottle. She is so sweet! The pictures below are showing you how she does in fact throw the doll on the ground and decides that she does still want to be the baby. Like I have told you before BellaRose is a helper and a doer. Give her a task and she is golden (pony boy). 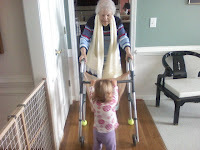 She loved helping guide Grandma around the house. 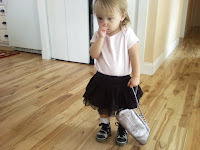 And finally BellaRose dressed as Cyndi Lauper! I know that the blog as been a bit boring as of late, but we will be getting more exciting again soon, hopefully. Worth is celebrating a birthday this week. The old man will be turning the ripe age of 34. Our good friend Matt turns 30 the day before Worth, so we will be having some fun festivities and many blog opportunities. Hope you had a good weekend, I got a facial. Can't beat that! These babies need some face time here on the blog. They have pretty much been ignored since ole BellaRose came around. We do still love them, and think that they are pretty great, but boy can they be annoying sometimes. 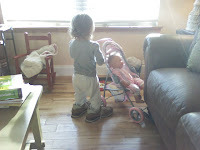 They are always underfoot and wanting something and when all my patience is given to little bean then they usually get the brunt of my frustrations. BellaRose has even learned to yell "NO" at them when they bark. I feel little bad about that. They are sweet dogs and were called our kids before Sweetie Baby. 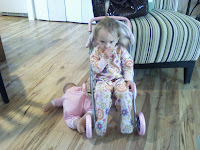 Rainy is so patient with her and lets BellaRose climb all over her and ride her. She usually knows that BellaRose will feed her too so that helps with her motivation. Now Atticus on the other hand usually gets up and leaves when little girl comes running at him. So this post is for our beloved dogs. So sorry we don't love on you as much as we should, but this family would not be complete with out you! I hate to do it, I really, really, do! But it has to be done, the Christmas decorations have to come down, and I have always in all my years done that on New Year's day. I wasn't going to this year, our tree was too perfect, our decorations were not getting in the way, but it is a new year, and with that a fresh start, a clean house, a de-cluttered house. BellaRose and I were left here yesterday, new year's day, and I just started un-decorating, thinking I would leave the tree, but it just happened, the tree's ornaments just came off one by one. BellaRose was happy because she was FINALLY able to touch the tree. I could not bare to totally get rid of the tree so I slowly slid it through our living room/kitchen and out onto the deck where I can still stare at it for a bit longer. It really was/is the perfect Christmas tree and deserves proper love and a send off. I was also a bit anxious to see what our "new to us" couch would finally look like in our home. My mom has had this couch for several years and I have always coveted it, she finally gave in to my urges (and she wanted a new couch). This couch is the most comfortable thing I have ever sat on! The best part is that I don't have to brush this couch (we can talk about that later!). The picture to the left is with a flash and I don't particularly like most pictures with a flash, but this is to show of the pillows I bought that compliment the new lamp so well! Thank you mom!